For this Not-So-Wordless Wednesday post, I thought I would share the words of others, words that could somehow capture my feelings as I stand in the garden clipping some of the final blooms. 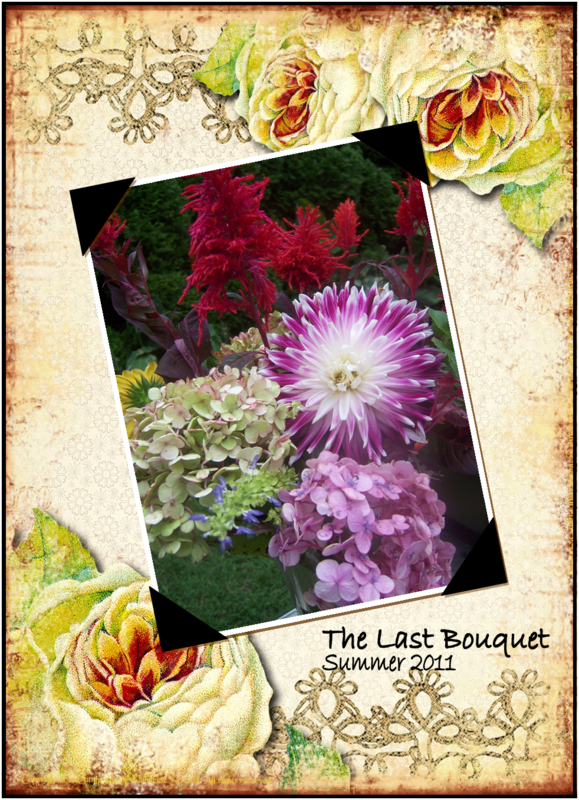 The last page in this summer's garden scrapbook. There is a definite chatter as I get to work, selecting what’s left among the flowers. Looking at the leggy stems, some of them browned, and the leaves dusted with powdery mildew, I can definitely hear a chorus of pleasantries and goodbyes as the summer guests make their way to the garden gate. There is a definite somberness and calmness in the garden today. Perhaps it’s because plants that I have nurtured for so long, some from seed started in February, are leaving after a full season of delivering what was promised — and paying my respects is the right thing to do. Maybe it has to do with the color of the sunlight, warm and golden, fading from the brightness of July. The shadows seem longer, and the colors more muted – and yet, it feels warm and glowing, especially as the sunlight hits the faintest change of color in the leaves overhead. More likely, though, the overwhelming sense stems from a combination of the two — and a little imagination. Oh, yes, there’s a lot of dragging and creaking happening by this time of year. I do feel the energy of summer leaving me — or maybe it’s just sympathy pains for the plants. Gardeners, I think, develop a kind of symbiotic (or co-dependent) relationship with their charges. When they sprout, I sprout. When they bloom, I bloom. And when they wither away, a piece of me goes with them also . . .
Until the process starts all over again. Beautiful, albeit bittersweet sentiments. Your final bouquet is lovely, as are your thoughts and words. I have enjoyed your writing so much, and look forward to reading more in the future. Thanks for sharing your gardening experiences with all of us! Hi Aunt Pat — thanks for reading. I’m glad you’re enjoying what I’m writing — it has certainly been a great outlet. Tell you what — I’ll jump on a plane and have some Autumn tipple on your side of the Atlantic. I know what you mean about the spiders — it’s especially nice when I leave for work in the dark of morning and I get a face full of silky webs. That usually sets off a barrage of epithets. So much for the peace and tranquility of the morning. Be well! I try to bring a few flowers in at this time of year too, hoping to enjoy them just a bit longer. I like the idea of a symbiotic relationship. I always seem to have more energy for the garden in spring, at this time I’m ready to pack up and head indoors to sleep for the winter. I agree! I love the rush I get in the spring time when I spot the first hint of green poking up through the soil. It’s exhilirating — and I can hardly wait to get out there and clean and rake and dig and plant. Until then, it’s time for a long winter’s nap. Be well! I could relate to each quote, and your words are perfect for the feelings I think every gardener feels as he begins to bid the garden adieu. I never “felt” the seasons like I do now that I garden. I suppose you’re right – I’m a bit co-dependent on those blooms! Hello there. We may have to start a support group for all of the co-dependent gardeners out there. There may be more than we even think! Thanks for commenting. When they bloom, I bloom. And when they wither away, a piece of me goes with them also . . . I can so relate to this sentence. I always hate to see the last of the flowers. Your last bouquet is beautiful Kevin. Hi Lona. Thanks for your kind words. It’s so strange, but at this time of year, I wonder why I garden — and ten spring comes, and I know why. . . Wonderfully evocative, Kevin. What gardener hasn’t felt the draining loss from an ending, mixed with the inspiring anticipation of the next beginning. And yet, we keep returning to the soil. . . Gardeners must be masochists.